These lifts are enormous aids to developing the power zone (hip flexors, hip extensors, spinal erectors, and quadriceps). As the athlete progresses through the lifts, the importance of core to extremity muscle recruitment is learned and reinforced. This is foundational to the effective and efficient performance of athletic movement, and alone would justify the practice and training of these lifts. Mastering this progression allows detection and elimination of common postural/mechanical faults. The pelvis “chasing” the leg during hip flexion and other common faults plague more athletes than not. The ability of the abdominal muscles to maintain midline stability becomes critical when driving loads overhead. The role of the hip is increased in each exercise to assist the arms and shoulders in lifting the load overhead. 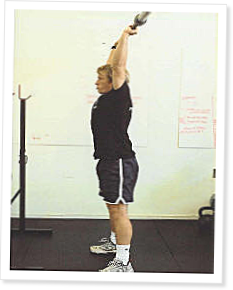 After mastering the push jerk you will find that it unconsciously displaces the push press as your method of choice when going overhead. What a great way to crush your spinal disks and render yourself a cripple for life. I did this when I was in high school and am now 50. I will regret these violent weight lifts forever. Hey Frank, After you get done reading McGill's Uiltimate Back Fitness and Performance you will know that it is not extension (proper low back mechanics during all lifts) that causes disc injury it is flexion! That is, poor technique.